ComCat® promotes growth of seedlings by regulating mitosis in meristematic tissue, thus stimulating root and coleoptile growth. ComCat® also stimulates flower bud formation leading to more flowers and higher yields. In the case of commercially cultivated cut flowers an added advantage is larger flowers and extended flowering time. Importantly, ComCat® has a membrane energising function regulating the transport of sugars from the source to the sink. Initially sugars are trans-located from the leaves to the stems (storage organs) and ultimately to the fruit and/or seeds during the grain filling period. ComCat® enhances the process leading to significant yield increases in a variety of crops. Further, ComCat® induces the synthesis of Pathogenesis Related (PR) proteins, such as peroxidase, glucanase, lypoxigenase and b-1,3-chitinase, by expressing the genes respectively. These PR-proteins prevent fungi from infecting the plant and therefore increase the natural resistance of crops to biotic stress. All plants receive positive (water, light, CO2, O2, fertiliser) and negative (stress factors such as drought, heat, cold, disease, flooding) signals on a daily basis. For each of these signals receptors exist in membranes (plasmalemma and membranes of cell organelles) that are responsible for interpreting the signals. Via the receptors signals are chemically transferred to genes on chromosomes in the nucleus of living cells. Specific genes are stimulated to “open” and initiate the process of translation, (protein synthesis) that synthesises new enzymes [OR] activate existing enzymes. The enzymes referred to are specific in their action and each regulates only one specific chemical reaction that forms part of a specific biochemical pathway. The biochemical pathway can either be part of primary or secondary metabolism. (a) When the sun rises in the morning, the plant reacts on the light signal by activating the primary metabolic process photosynthesis as explained above while the opposite occurs when the sun sets in the afternoon. (b) The primary metabolic process respiration is, however, not light dependant but oxygen (O2) serves as the signal to activate the process 24 h per day. 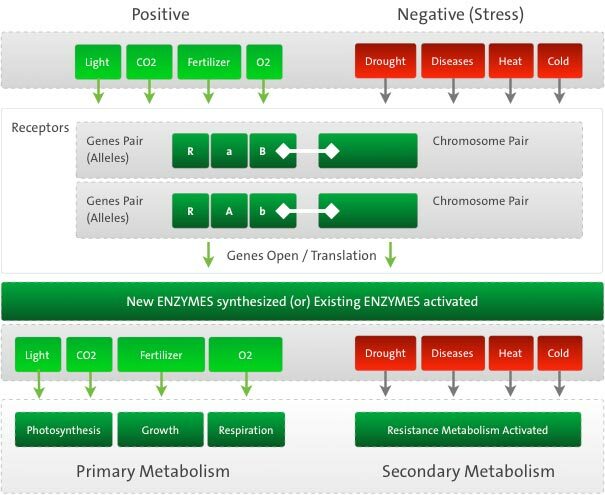 If a plant is resistant towards drought, the drought signal will activate (“open”) specific genes that will lead to increased Abscissic acid (ABA) and proline levels (both are secondary metabolites) via the Mevalonic acid pathway and Glutamate shunt respectively. Both proline and ABA is involved with drought resistance in plants. If a plant is resistant towards a specific fungal infection, a signal will be received when the plant comes into contact with the fungus which will activate a resistance mechanism. E.g. specific genes will “open” to initiate the production of PR-proteins (“pathogenesis related proteins“) that will prevent the plant from being infected. The timely application of ComCat® supplies “warning signals” that induce stress tolerance in monoculture crops and prepares the plant beforehand to resist stress conditions that may develop in future. To download the trials results right click and select save as. Please feel free to get in touch with us if you have any questions or comments. Use the button below to access the contact form or view our contact details. We look forward to hearing from you!